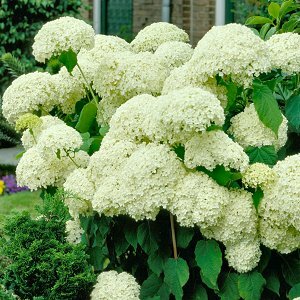 The Hydrangea Annabelle, 'Hydrangea arborescens 'Annabelle', is a wonderful hydrangea that produces white flowers up to 12 inches across. Annabelle blooms every year even after severe pruning or intensely cold winters. The huge, white blooms appear in profusion every year without fail in early to late summer. It is perhaps the most popular old-fashioned shrub grown in American gardens today. The flower size increases as the season continues, so that the final flush is an extraordinary show! Use Annabelle in borders, hedges, foundation, or accent plantings.